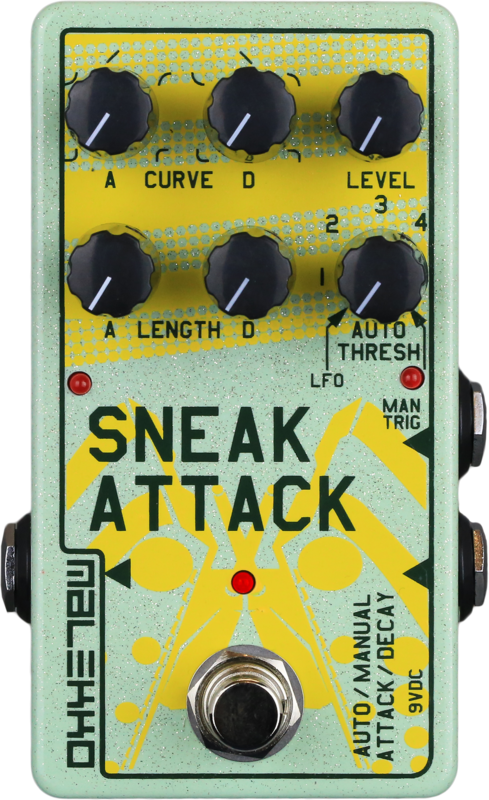 Sneak Attack is an auto-swell volume pedal that can also be manually triggered or used in a tremolo mode. 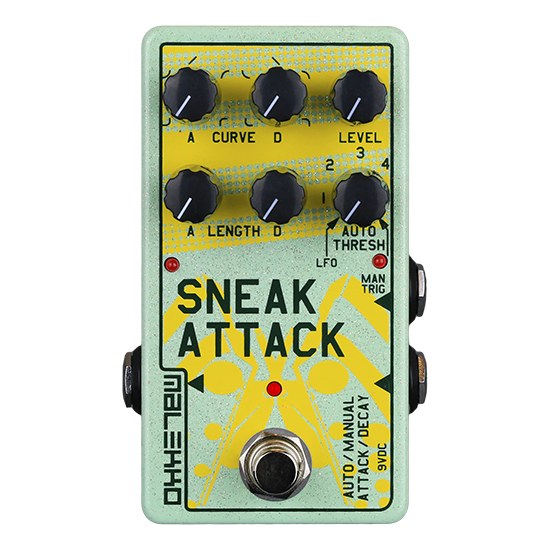 The core of the pedal is an Attack/Decay envelope generator with separate length and curve controls for both the attack and decay segments. The envelope can be triggered or cycled in several ways using the input signal, built in footswitch, Lil’ Buddy footswitch or external clock/click track. Sneak Attack suddenly has low volume, volume drop, no volume or “just stopped working”. The output level setting is actually saved when you are in LFO or MANUAL TRIGGER modes (so if you had the pedal in MANUAL TRIGGER MODE and your LEVEL knob was turned down, then you switched to LFO mode, the level will still be low). You can simply reset your levels by turning the AUTO THRESHOLD knob to MANUAL TRIGGER and readjusting the LEVEL knob. Sweep the LEVEL knob right, left, right. The pedal’s volume will now be set louder than the input, and you can adjust to taste. Pedal is powered by a 9v DC adapter (neg tip) or internal battery snap. Current draw is 50mA.